Join us live each week at www.productivity.academy/live and get your questions answered by submitting them at anytime right here: www.productivity.academy/questions. You can watch the video for the past episode recorded on October 4th, 2018 above, or you can review the transcript below. How can I deal with being a perfectionist? What are some good tools for managing content creation? How do you keep yourself productive when working from home? Welcome. I’m Adam with Productivity Academy and welcome to Episode 54 of the open Q&A here in the Real World Productivity Group. First off, if you’re watching this live, thanks, and welcome. We’ll get started here in a second. Just want to go over real quick, the questions we’re going to be talking about today. Had some really good ones, somebody at the website was asking about how to deal with perfectionism. So that’s kind of a broad topic. But I think there’s some good insights that we can talk about, about how that can impact your work, and what you can do to kind of steer around that. And then somebody else was asking about knowing what to do in terms of just, you know, you’ve got this that the other thing you got a big task list, what are you supposed to do? And then the third question today was best ways for managing content creation or the best tools. So that’s definitely something I deal with, both with the productivity Academy and other businesses. So happy to talk about that offer some insights around the tools you can use, and then how you can stay productive at home this week, I’m at home. Certainly a topic I know. Well, I know a lot of you either working remotely you’re working at home or working on your office think that this is an interesting topic, and always one that we can learn about and talk about some more and find some new ways to deal with. So real quick, just wanted to say, if you haven’t yet joined the group, you can join us live, you can find the link below. If you’re not in the group, just answer the questions. And you can join, it’s free group. And then as well, if you’re watching this on YouTube, if you’re catching the replay, you can always click subscribe, and stay up to date with Obviously, these Q&A’s every week, as well as videos on applications, process, automation, and all that sort of stuff. So if that sounds like your jam, then you’re in the right place. Let’s get into it with the first question. So on the website, somebody had asked, you know, how to deal with perfectionism. And so the way I see that is, you know, that point where you never feel like you’re quite done, there’s always something that you can do. And, you know, that’s in itself, not a bad thing. Because, you know, certainly you want to put out something that’s high quality that you’re proud of. But once you start to realize that, you know, maybe that’s going too far, because makes me think of like, design stuff, which I’m terrible at. But, you know, the color doesn’t seem quite right, or this or that, you know, if you’re getting feedback, that’s fine, let’s say you’re making a logo for a client, they said, you know, it’s not right, or don’t like it, that’s one thing. But if you’re just self limiting, and saying, you know, I don’t, you know, it’s not good enough, or the, you know, the color is not quite right, other people won’t like it, then, you know, if you’re not getting feedback, that closed loop system in your head can be pretty vicious. And I think we’re all used to that, in the sense that, you know, we can be our own worst enemies in the sense that, it’s really tough to, to, to end that loop if you’re not actually getting outside feedback. So I would say that that’s a good step two is to get outside feedback, whether again, you know, really depends on your situation, but I’ll just leave it at, get some feedback on what you’re working on, you know, are people shooting it down in flames, and telling you, you’re a bad person from what you did? probably not, you know, and a lot of us assume the worst. So, get some feedback, get that outside loop going, so that you have some real world feedback, instead of just what’s going on up here. The other thing to consider with this is, even if you get feedback that, you know, it’s like, Oh, that’s good, you know, or, like, Yeah, but that’s okay. You know, that might be good enough, it depends what it’s doing what it’s intended for, if it’s an article, you know, if it’s something that you can work on later, then, you know, there’s a chance for you to say, That’s good enough, now, it needs to be completed, it’s done. And if the opportunity comes up, or I can schedule time later to come back and add details or fix, you know, the little odds and ends. So, obviously, given this is situational, you could do this in areas, perhaps like writing an article where you could always continue maybe to expand it, and you come up with new ideas later, new angles, you know, if you’re building a highway overpass, don’t do this, that needs to be done a certain way. And it has to be done that way the first time. But I think for most of us, we can look at this and say, Hey, you know, there’s a reason there’s things like MVP, or minimum viable product, because something needs to just be good enough, it needs to get out there into the world, so it gets real feedback. And again, that applies to content, it applies to online, you know, training and applies to products everywhere. So I think that that’s something really good to remind yourself about is you need to get stuff out there and start getting some feedback. You know, definitely, if you’ve seen my Q&A’s, there’s been somewhere, I can guarantee you, I didn’t have enough time, or I felt rushed, because I may be, you know, as much as I talked about using the calendar, and I’m very good about doing it now, we all make mistakes. And I said, Oh, great, you know, instead of having, you know, 30 minutes to get ready, or to write some notes, or do something, I’ve got five minutes, and I want to stick to the schedule and go, and we do the best we can. And, you know, you’ve come up with ways because of that situation to get better. So lastly, I want to touch on this for perfectionism. And I think this applies in a lot of other areas well. But if you believe in what you’re doing, then I feel like you, you need to get it out there. Okay. So it’s not an excuse, you know, we don’t want to put a poor quality things out, we don’t, nobody intends to generally put out, you know, crap. But we, you know, again, we self limit ourselves. And we think about this too much. And we get in our own heads. So if, you know, you sit down, and you think about whatever it is you’re working on, if you truly believe that you have that you’re good at what you do, then you kind of owe it to yourself, as well as everyone else to get that out there. And whether that’s part of it project that you’re then passing along to the next person. But by just keeping it internal, and, you know, worrying about it and trying to get everything right to the nth degree that generally isn’t helping, right, it’s not getting your, your, your work out there so that you can help other people by doing that. So hopefully, that’s helpful. And certainly, I’m not a perfectionist. But identify, I think everyone can with certain areas where perhaps we are, maybe it’s our strengths or weaknesses, but there’s areas where we’re always trying to fine tune something. And sometimes we just need to say, Okay, you know what, I did a very good job, it’s done, it’s complete, and if the air rises, or if I can add to it later, I’ll do that. So good question. Good topic, not one that comes up very often. But now a topic that somewhat similar, and I found this interesting was just knowing what to do. And I think this comes up occasionally in different formats. And people look at it kind of from different angles. But basically, this boils down to knowing what’s most important or understanding what is we should be working on. So I’ll start as always with saying, hey, if you don’t do a daily review, the definitely This is one place you can start. Because once you start seeing these tasks, and these goals over and over, it becomes much easier and more clear, because you’re seeing these over and over, you’re building that habit where you’re saying, Ah, I’m seeing the same things again, and again. And part of that daily review is looking at your goals, you know, what are your big goals, what are your kind of like, 90-day goals. And by reminding yourself of those every day, and this doesn’t take long, if you can just scan through the goals that you’ve written down, or that you typed out somewhere, okay, well, that’s the end result. While then as I go through my tasks, I should now a little bit more easily understand what I should be working on. So this won’t, this won’t save you from procrastinating and won’t save you from you know, having to do hard work. 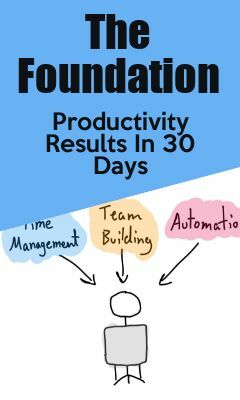 But this will help you understand that when you use that daily review, weekly review in that you include your goals review that, you know, you really start to understand the bigger picture and then on a daily basis, or even hourly basis, you understand how your tasks fit into that. And that just helps you kind of mentally or I would say, almost automatically start organizing. Something else I would use if you’re I’d use this for a higher level review. This isn’t something I use on a daily basis. But let’s just say you’re stuck, you’re like, you know what, I’ve got like five projects, I’m not sure what I should be working on a measure of what really has the most value, or I do this on a quarterly basis, it uses an expected value calculator, that’s just a fancy name for putting in your project, assigning some values to it, and looking at what the numbers put out and tell you. And then from there, doing little bit of, you know, maybe you have to adjust things a little bit. But I can’t share the screen right now. But I will share it right here. There’s an earlier post that I did in June. And this is pretty cool. This is a post that has the calculator in it, it’s an air table. And so what you do is just put in something you can adjust it however you want. Okay, I have personal business and second business. And, you know, you can take those out or change them. But what I do is list what the project is, just give it a descriptive name. So you understand it when you’re looking at it later. And then there’s four or five actually, main columns, how excited am I okay, and all these are on a scale from one to five, one is low, five is high, and you give it a score, you know, just personally, how do you feel about this, you know, this is project or task? Are you into it? Or is it you know, just busy work that has to get done in order to move the project or to, to, to be sorry, to finish, you know, whatever it is, maybe it’s a project, but as part of another project, something like that. So, just, you know, do a little self-reflection, look, think about it, and be honest with yourself, are you excited about it or not, and give it a score. Okay, next is a 12 week ROI. So 90 days, you know, if I did this, whatever it is what would be the payoff in 90 days. And the payoff doesn’t necessarily have to be monetary, maybe in your personal life, you’re saying, you know, I’d like to lose 10 pounds over the next, you know, six months? Well, you know, the 12 week ROI would probably be pretty good in terms of health, focus, motivation, just, you know, that type of thing. And again, that’s not monetary, so just, you know, understand what you’re talking about, and give it give it a number, then we have the 24 month ROI, and you can adjust this could be 24 months, could be 36 could be one year, whatever it is, but a longer term, what’s the payoff? You know, again, if we use the weight loss goal, you know, that would probably have a very big effect on your long term. And in terms of your health, and how you feel things like that. And then it calculates out the total value for you. And it does that exponentially. So it’s higher your, you get a large score for giving high values, and it’s much larger than just the sum of values. And so it helps you pull apart real quick to say, Well, if you have a project that’s mostly fives, and you’re really excited about it, you think it has a heart high ROI and the near and far term, then it’s going to have a really high score, as opposed to something where you’re, it’s maybe three is across the board, you’re like, yeah, you know, it’s okay. And I’m not against it, you know, and I think they’re all I will be okay, you’re going to really see those things separated. And then you can go through there and see ah, okay, just by assigning those numbers, and you had to choose those numbers, your least getting out of your head, you know a little bit about what you maybe subconsciously think or feel about this, as well as any knowledge you have about the project. And then you can go from there, maybe, you know, you can’t organize them directly by the score that popped out. But I think that that should definitely put you on the right track and at least get you in the right frame of mind to then say, okay, that’s what I should be working on. All right. The next question was best ways to manage content creation in terms of like, the apps to use while you’re doing this, to pull up this question. Yeah, what are some good tools for managing content creation. So I’m not going to spend too long on this, I think this might be good to expand upon and actually show the real quick, I would say, the top one of the top tools is Trello. This is obviously if you’ve Hopefully, you’ve heard of it by now. If not, though, it’s a great and flexible tool. And one of the power of you can use in Trello they have a lot of power ups, you can use it on the free plan, I believe, you can activate one per board. And so one of these as a calendar. So that’s really powerful. Because you can create lists is how Trello works with individual cards on them. And and then assign dates. And so you can flip the view look at as a calendar and you have like an editorial calendar. So true. Trello, allows you to do things like let’s say, you come up with idea generations for content, I’m just going to pretend it’s a written article. So we have that. And then let’s say once you’ve done that, you assign it to a writer, a writer writes it, and then they move it to the next list where it’s maybe a review or edit, and then it goes to publishing. And then it gets published on the website. So you could have a list for each of those. And then you can assign them to the different people in there. And you get notifications. And it’s very visual as far as what is where. So that’s great. Just alone, there’s a lot you can do with that you can hook this in with automation tools like Zapier to give notifications in different areas. I’m not sure if you can automate it directly with slack. Or if you need to use Zapier, but you can automate notifications to a lot of areas. So let’s say a writer gets done with an article and they pop it into the ready for review list, then your editor gets notified that you know, this needs to be done. And then in the card, that you can have instructions that say, like, you know, once to move to the publish and design, you know, whoever your person is that you have doing that to publish to the site include any instructions anyway, super powerful. The big time and I see here is Google Docs. So for a distributed team, especially this works really well. So you can have something in a Trello card, where at the top, you generally have some sort of description at believe they call it, but it could be instructions, and you could have like, link to source document, link to the article links to whatever. And you can make that a template. So you can just copy that each time you’re doing this. But then the time with Google here in Google Drive, and Docs and Sheets is like, let’s say, the writer starts writing, they put the link to their Google Doc into the card. And as it moves along, everybody can click on that and have access. So I think that beyond that the power of Google Drive in this system is obviously can set up folders. So you can have some sort of hierarchy. And you can also give permissions as needed. So maybe your editor needs to have access to everything. But maybe if you have outside writers, they just need access to one folder. So you can control what goes on there in terms of who has exposure to what also sheets are very effective. Obviously, we’ve you all probably use spreadsheets. But using those for tracking content, this is good for idea generation to if you just want to have one centralized place where you maybe list out ideas or resources, things like that. And then lastly, I’ll include this because it’s something I’ve used before. And that’s using Google Forms. And this is helpful for sometimes if people in your organization, your business, your employees, whoever you want to have them input information that you can then pipe into other places. So let’s say you want to have people giving ideas for articles with maybe more than like a one liner, because you could just have something in Trello where they add a card and they just give it a description and say, Hey, here’s an idea. But maybe you could have a Google form where it’s like, okay, you want to submit an idea for an article and these title, it needs a description, and it needs, you know, some keywords and what kind of like images would be attached and like that would form the idea of this article. And then you could take that and pipe that into like a Google Sheet automatically, it would do that. And from there, you can take it anywhere you put that into Trello and then maybe assign that to a writer. There’s a lot of stuff you can do with that. So I find that to be handy. I use it for stuff a little bit more complicated than that, like setting up webinars. So we’ll say, okay, we’re going to do a promotional webinar with these people. Okay, we need their emails, we need the names. Is there any sort of a special offer? Do we get discounts or anything, you know, what are the benefits of, you know, is it training is it a product, whatever it is, we take all that and then the output is into our project management system where we then have the Build Team, go ahead and build out the webinar. So pretty powerful stuff. I’m also I already mentioned it but Zapier or you can use IFTTT, a lot of these automation tools. Another one be it I think it’s pronounced integramed. And then there’s more powerful kind of enterprise stuff beyond that, but trouble between travel and Google Docs. That’s where you can really get started. And then I mentioned the calendar intro, but also just using Google Calendar. If you’re already using Google Drive, you can do that for to have like an editorial calendar if you want something distinct are different from trello, or for whatever reason, it just works better for you. All right. Alright, let’s see. Last question. Woo I’m gonna put that live on the page. Are you perfectionist? If anyone’s watching, I saw that Facebook allows us to ask a little question. Now you can have a poll. So give that a shot. I thought that was interesting. I wonder how many people consider themselves to be perfectionist. So but the last question for today is how to stay productive at home? So very good question. I think a lot of us, like I said earlier, either remote workers work at home, have a small office, a small team. So a lot of this comes together, it’s just like anywhere else you would work a lot of these working at home strategies is a lot like working in the office. But the upside and This to me is really awesome, is you have so much more control over your environment. For the most case, I will say that is for me, maybe it’s not for you. But I find that most people, you’re able to really take control and optimize where you’re at, because you can. And so don’t forget about that, you know, sometimes we get locked in a pattern of, oh, I’ve got to do this, or there’s this going on. But if you’re working from home, or remotely, you are in control of your environment. And that is awesome. So I would say that the first thing you should do is don’t forget the basics, do your daily review, right, whatever that is for yourself, review your goals, you know, review your calendar, go through any, you’re if you have project management software, go through their prioritize, get your day going, plan it out and get started. And then circling back to where I started. Deal with your distractions. If you’re again, if you’re working at home, you own that environment. So do everything you can if there’s other people, they’re just like, a regular work environment, then do what you should do talk to them and say, Hey, you know, for this just me, is it for an example between six and 11 am, I am super productive, you know, I’d appreciate it if, you know, you kept distractions or noise to a minimum and, you know, I’m if it’s important, and of course, you know, you can, you can ping me and, you know, whether that’s your husband or wife or kids, you know, at least saying that to them. A lot of times we forget that, like, we need to say this, people don’t just understand that. And there did that too. As I when I worked for a company, as an engineer, say, Hey, you know, talk to my engineering supervisor and said, Look, I’m gonna put on headphones, I like putting on some like, white noise, music, you know, leave it off one ear. So, you know, people or I can hear someone’s asking for me, but I was like, I really appreciate it, would it be okay, if I had a couple hours in the mornings where I could kind of dive in and do my daily stuff, because if I concentrate, it gets done much faster. And then I’m, you know, available for the rest of the day and not trying to, you know, covered it all times. And if nothing else, people will appreciate you being upfront about that. And more than likely, you know, they’re going to work with you to get to either help you or to arrange it so that you can get something done. So those are the main ideas for working from home. I think the big one that we forget about is you’re in control of your environment. So do whatever you can to make it work for you, you know, a lot of and kind of think outside the box again, you know, hey, you can put headphones on block the noise, you can choose where you work, do you want to stand up every hour, that’s great. Do that, you know, think outside the box, do whatever you can because you’re in control of it. And so I think that’s a really cool advantage that a lot of people don’t take full use of so good questions today. Gonna wrap it up. If there’s nothing else, I don’t see anything. I see, Mike just joined. Hey Mike. So that’s going to wrap it up. I will see everybody next week for Episode 55.